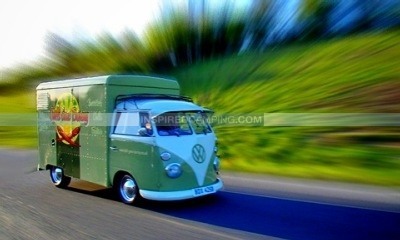 If you hadn’t noticed in the UK there’s a cool campervan and caravan food revolution going on. Many owners of these fantastic vehicles are helping to make their obsessions pay by offering unique, stylish and entirely satisfying food straight out of their pimped-up trailers. From Airstreams to VW Campervans and from chips to Mexican street food there’s definitely something for everyone. In fact, we’re beginning to see a banquet of dishes from these unique camper vans and caravans offering just as unique edibles, leaving us in no doubt that if you’re ready to hunt them out then there’s a feast to be had on a street corner or festival near you. 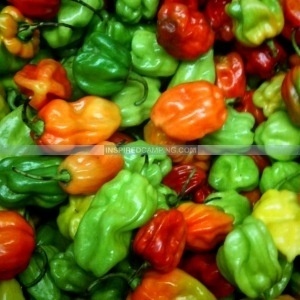 Here is a small selection of our most mouth watering finds so far. 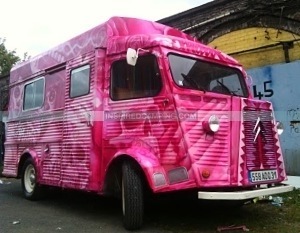 An award-winning camperlicious catering company (featured image) that operates from Lulabelle, a pink VW split screen campervan. For outdoor events, children’s parties and vintage tea parties with a difference, they offer high tea, cakes and muffins, with a huge dollop of VW campervan love thrown in. Operating from an Australian VW Splitscreen, Chilli Gone Barmy knows they have a unique selling point – there are only three ever made in the world and this is the only one they know of in the UK. In their beauty they offer mobile catering for festivals, parties and events and always make sure this VW Splittie made food has plenty of chillies. 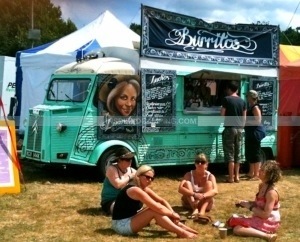 Luardos offer Mexican street food from two Citroen H Trucks. These trucks used to be a favourite for converting into campervan because of their retro and vintage beauty. However, since then their parts have been harder to come by. This is why we think Luardos burritos and their gorgeous converted and painted Citroens deserve a place here on our list. Pitt Cue offers American BBQ food from an American styled converted caravan. This is a proper meat wagon offering smoked pork in Soho, London. Their burgers are mouth wateringly delicious to look at and the next time we’re in the Soho area we’ll definitely be hunting them down. Do you have a food company that uses a unique vehicle to sell your products? Let us know in the comments section below, and remember to drop your email address in the updates box to sign up for our regular inspirations and giveaways. It’s free, you can unsubscribe at any time and we never share your information with anyone else. You’ll also get access to bonuses we only offer our subscribers. Our next bonus is particularly juicy. It’s a DVD copy of The Bus, a Damon Ristau film about the VW Bus (Campervan), a vehicle that’s an icon in the US, UK and many other locations around the world. This is a gift of freedom, love, youth, breakdowns and adventure… and this free copy is only available to our subscribers. If you have a unique accommodation business visit Inspired Courses to learn how to set up a glamping business and improve your marketing.